The writing forwarded below is by Wang Yu-Hsuan, Taiwan, who wrote this in the night before her leaving on April 26. We, in the village, used to call him Emily, her nickname. 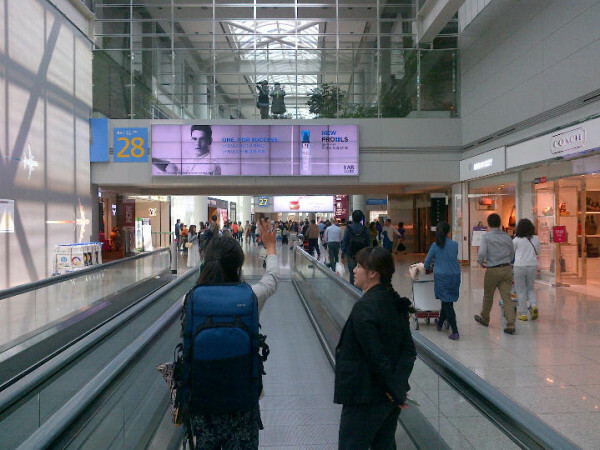 She came to Gangjeong in 2011 and has been recently in overseas for two months. It is very emotional day for all the people who have known and thank her wonderful spirit that inspire many. Regis Tremblay immediately made a video on her on April 24. You can see it, here. Many Korean news media including Hankyoreh, Ohmynews, Gobal News, are reporting unjust entry denial against her. She is the victim of vicious Immigration Control Act (See No. 3 and 4, item 1 of the Article 11, which can be indiscriminately applied to any internationals to the violation of their human rights ) of South Korea. 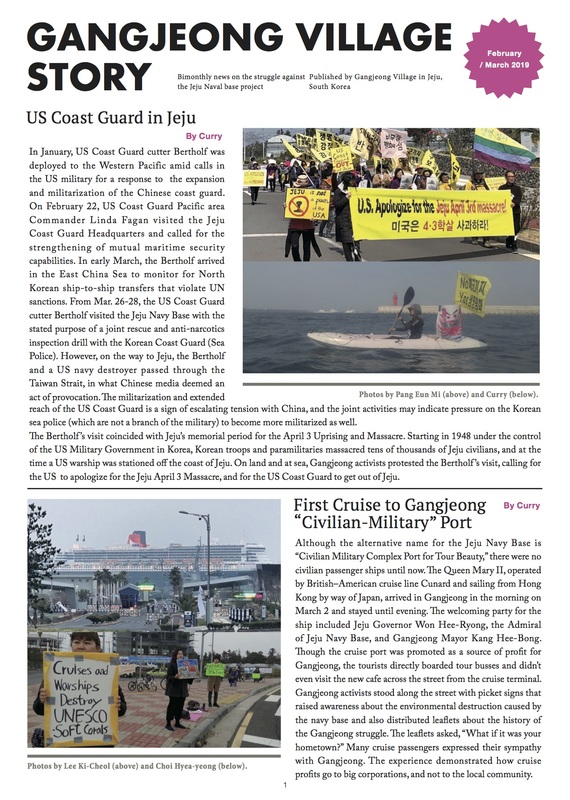 21 internationals have been refused entries in relation to the Jeju naval base issue. 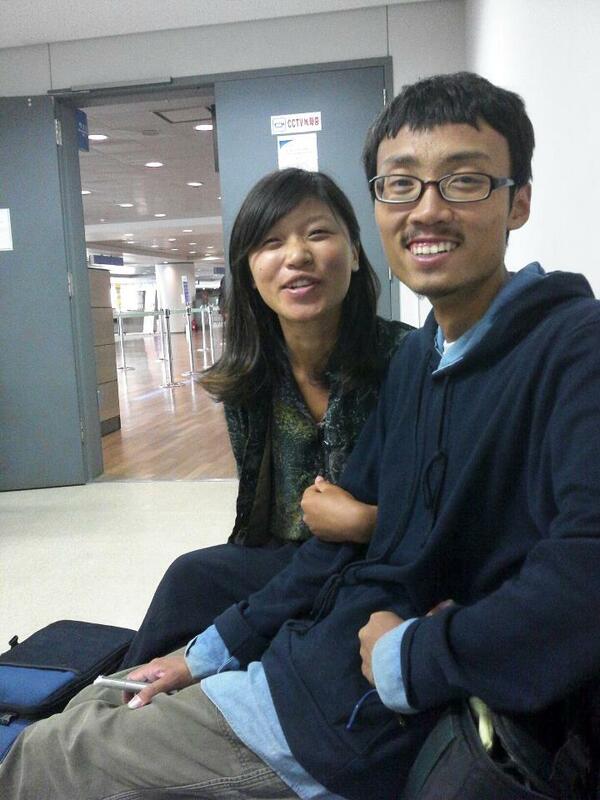 Beside that, Benjamin Monnet and Angie Zelter have gotten injunction and exit order respectively for their peace works in Gangjeong, last year. We hope this tragic moment would inspire many. We thank and bless Wang Yu-Hsuan for her new journey of life. 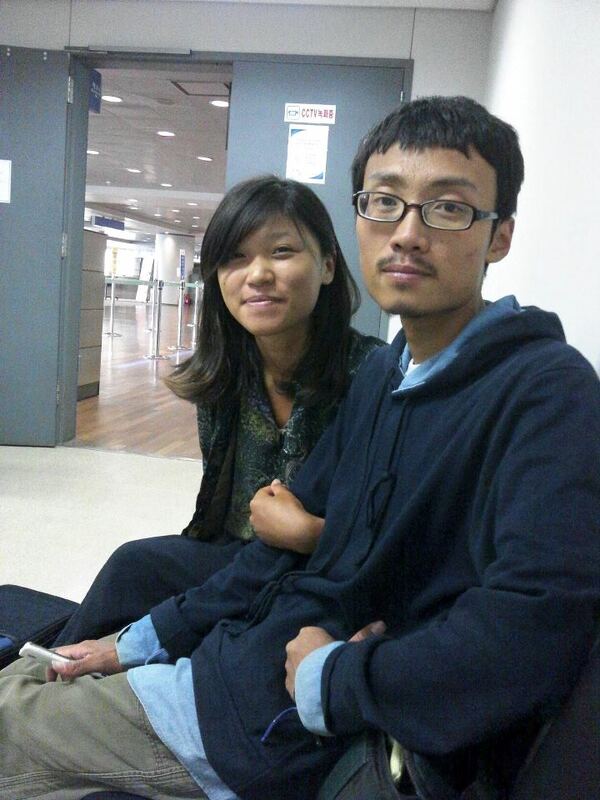 Wang Yu-Hsuan (Emily Wang), a peace worker, is with her lover, Kim Dong-Won, Incheon Airport, in the morning of April 26. The South Korean government rejected her entry into Korea without explanation. ‘I won’t sign the document which they asked me to sign, and I won’t leave by my own legs. And I need a clear answer why I have to be out especially when I hold a legal visa by Republic of Korea, and when I applied my legal visa, I did explain well what I do in Korea. I work for peace. 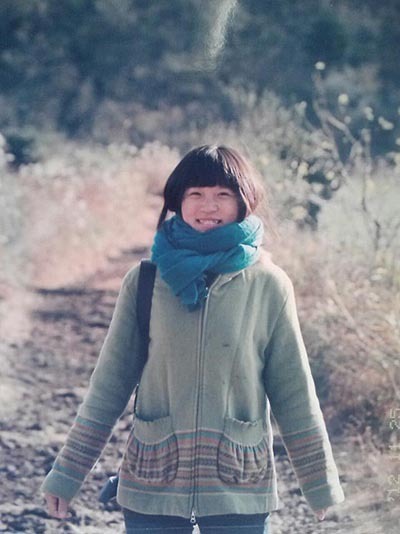 I am a peace worker.’ (Wang Yu-Hsuan in the morning of April 25). 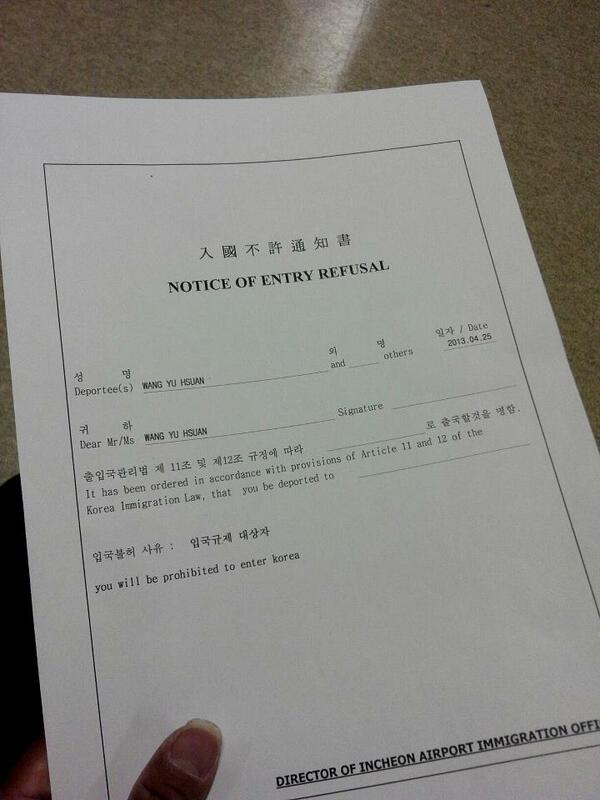 She has persistently demanded the reason from the Immigration Office since she got this notice from it on April 24. I am leaving for Taiwan tomorrow with a ticket by my friends. I have to many to say, so I don’t sleep at the late night in the airport waiting room. Please read it. I want to express my deep thankfulness for every small effort which you have done for me. I am not a perfect peace worker, but I would like to be brave to identify myself as a peace worker. Since I got to know I am not to be allowed to enter Korea in the afternoon of April 24th, the immediate warm supporting action has been taken by the friends who I know or the friends who I don’t even know around the world. When I am struggling in the immigration office in Incheon airport on the first day, I had my Korean friends who fly the same flight with me to support me and be with me although soon they were taken away. And in the first day’s stressful process in the immigration office, I won’t forget the endless ringing form the protesting phone calls and it bothered the immigration officers so much during the process. I never forget the immigration officers came to me to ask me to stop the posting on twitter as they’ve been annoyed so much by the protesting phone call and “even the phone call from UK!” said with an annoyed voice by one immigration officer. I talked on the phone of Immigration office with some protesting friends as they requested to talk with me who got stocked in the airport. You will know why if you ever stay in Gangjeong. You will know why people become so sensitive about their names. I, as one of the peace worker in Gangjeong, know about it. As a peace worker, we want to practice trust not doubting but one of the pathetic thing is a vicious circle of mistrusting. How beautiful my name is but for such a long time, I couldn’t tell my name in public. It’s uncomfortable experiences but I am not surprised that ROK know about a small person like me. The Gangjeong police called my nick name “Emily” so naturally as if they have been knowing me for a long time. But I’ve never introduced even my nickname to any of the police, and since one day, even the security guys of naval base called my real name (passport name) to one person who’s appearance is similar with me. I don’t want to deeply think of how they discovered these personal information as I want to be happier. haha But anyway I keep in mind that the nightmare which happened to many other our foreign friends may happen to me some day. And it happened now. Without the bad record from ROK police, I am directly on the national Red List! And so far, under the pressure of Korea congress men, the ministry of justice of ROK remain silent on the reason why prevent me from entering Korea. It’s an (inconvenient) secret. Firstly, when I was brought to the immigration office and being told about what happened to me, I wasn’t cool enough to arrange my feelings and words. 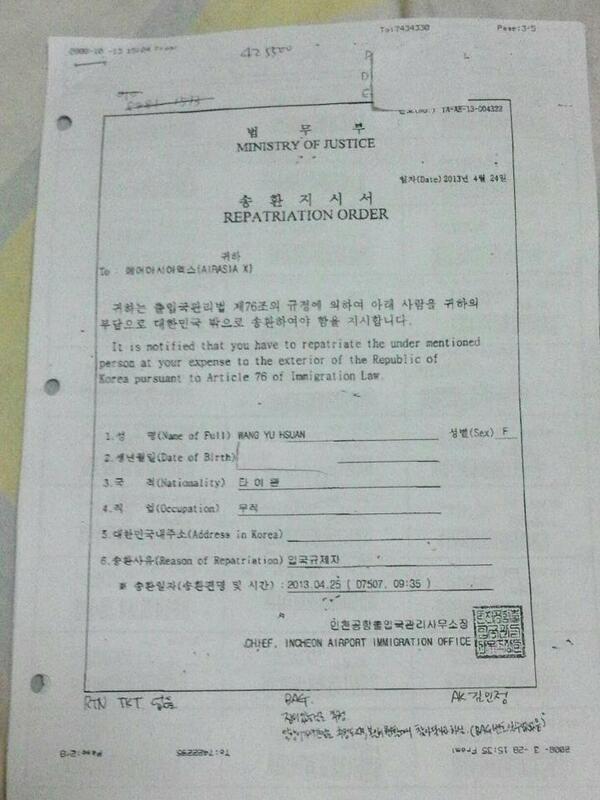 I just kept requesting to the officers to tell me why a person like me with the legal visa issued by ROK got rejected to enter to Korea suddenly after a short oversea trip. I’ve been living continuously in Korea since 2011, but suddenly you reject me to enter again, and then how about all my “belongings” there: I still have family and friends there, I have seniors and Juniors there, I have love there, and I have inspiration there. I just thought ROK, you are very RUDE! You don’t even have the manner which the elementary student usually have. By giving me the special label, I want to say thank you. You give me a big present to continue the vision of Inter-peace islands solidarity. I traveled out of Korea partially for the Inter-peace islands solidarity, but now I must be out of Korea for at least 5 year. I wonder how to receive your big present with honor. I was not happy but accepted the group decision. But after I clean up my mind in my last night in Korea (actually not Korea but the waiting room in airport), I was happy again as I begin to understand that I should walk back to Taiwan and other islands by my own will to realize “inter-peace Islands”. It’s not new to be carried out for a Gangjeong person but this time, I am not going to be carried out but I will walk beyond because I am not blocking but walking a new way. Still I demand an official reason from ministry of justice, but now the burden lays on my families and friends in Korea who promised me to take the responsibility. Instead, they asked me to walk ahead with dignity. I am awakened about the price of my final dignity and I’m also awakened about the Big Present from ROK. Too many thanks to say, so I said to the one. Let’s work together, let’s not leave each other alone in the way of peace, so that we can finally say no to the war base. War Base you are really Bad and RUDE! A sad but unforgettable moment. We wish much bless to both of you! ‘I am one of the people who has known Emily very well. I interviewed Emily who came from Taiwan on a day of July, 2011 when I had been much staying in and reporting on Gangjeong. 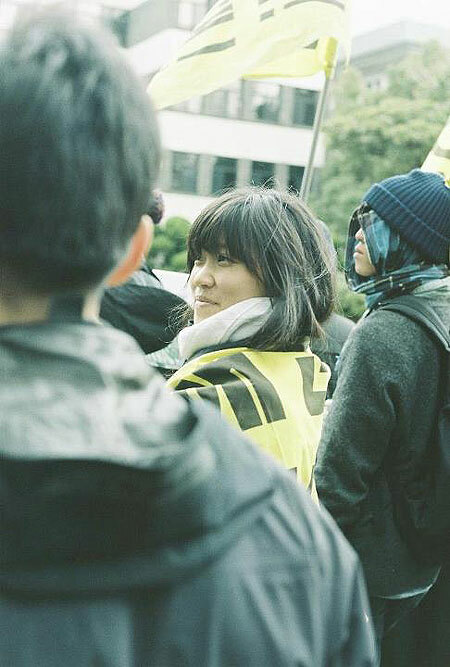 Emily joined the struggle opposing to the Jeju naval base project, staying in Gangjeong village since June, 2011, along with other members of the ‘Frontiers,’ an international peace group.